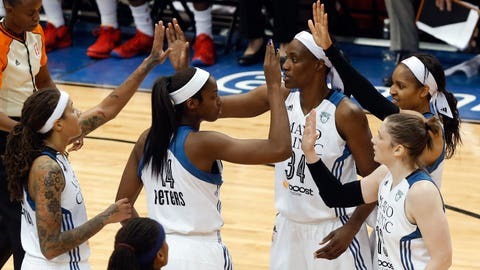 Lynx players celebrate a play against the Indiana Fever en route to their Game 5 victory in the WNBA Finals on Wednesday night at Target Center. MINNEAPOLIS — Tears streamed down the face of Seimone Augustus. Lindsay Whalen limped off the floor with a badly sprained ankle. Maya Moore couldn’t hit a shot. "This never gets old," champagne-soaked Lynx coach Cheryl Reeve said. "We kept grinding and working despite everything that we’ve been through," Augustus said. January and Catchings helped turn Indiana into a tough, confident bunch that erased an 18-point deficit to beat the New York Liberty in Game 2 of the Eastern Conference finals, but finally ran into a wall they couldn’t break through at the boisterous Target Center. "They just outplayed us in every single way," Fever coach Stephanie White said. "They looked like a team that was on a mission and they played like it." Four finals appearances. A championship every other season starting in 2011. And on Wednesday night, a little revenge that was three years in the making. The Fever stunned the heavily favored Lynx in 2012, beating them at home in Game 1 and finishing them off back home in Indiana to dethrone the champions. The Lynx came back to win it in 2013 before losing to Phoenix in the Western Conference finals last year. The march to their third championship was harder than ever, with Whalen and Augustus missing big chunks of time with injuries and a style-altering trade that brought Fowles to the post midseason. "Those are things that kind of fueled this group," Reeve said. "At the same time it made them appreciate things." Reeve said the struggles made her veteran core appreciate this run more than any other, and they partied like it. A private concert at Prince’s Minneapolis estate awaited and no one was about to miss it. "Wasn’t a perfect year, perfect series or a perfect game," Moore said. "But we’re champions."